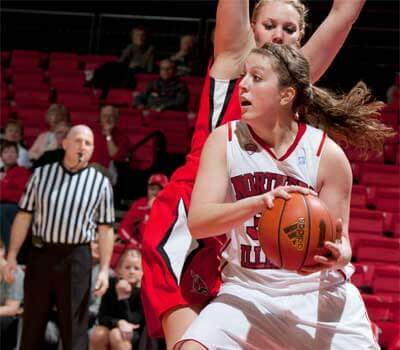 A rare 34-point first half paced the Northern Illinois women’s basketball team to a 58-44 win over Ball State on Thursday night at the NIU Convocation Center in a Mid-American Conference West Division contest. The win moves the Huskies (12-12, 6-6 MAC) back to .500 for the first time since Dec. 31. “It was a really tough game, really physical,” said NIU head coach Kathi Bennett, who is now 7-1 all-time against the Cardinals, 3-1 with NIU. Since Ball State (8-17, 3-9 MAC) topped NIU 50-43 on Jan. 11 in Muncie, Ind., the two teams have gone in opposite directions — NIU is now 6-3 since then, BSU 1-8 — and it was apparent as the Huskies earned their largest conference win of the season in a 14-point decision without trailing at any point. Since starting 0-4 in league play, the Huskies have gone 6-2 to be .500 in the MAC for the first time since Jan. 12, 2010, and have reeled off three straight wins for the first time since Nov. 14-19, 2010. With four games left in the regular season — two at home, two on the road — NIU moves into sole possession of fifth place overall in the MAC and third in the West. The Huskies are two games behind Miami (Ohio) for fourth place overall, which guarantees a bye into the MAC Tournament quarterfinals. From the tip, NIU was locked in and focused as it quickly grabbed a 16-9 lead following a three from senior Courtney Shelton (Rockford, Ill./Hononegah) with 10:13 left in the first half. A few minutes later, the Cardinals closed within three points, 19-16, and NIU burned a timeout to regroup. The quick break proved to be just what the Huskies needed as they finished the last 7:40 of the half on a 15-3 run to complete the second best first half of the season with a 34-19 lead. Only a 37-point first half against Western Illinois in a 91-84 double-overtime on Nov. 16 was better. Freshman Claire Jakubicek (Cary, Ill./Cary-Grove) scored six of her 11 first half points during the spurt as she was one of three Huskies to rack up double figures in the half. Shelton and freshman Amanda Corral (Hobart, Ind./Hobart) did all their scoring for the game in the half with 10 apiece and combined to go 7-for-7 from the field with two threes each. Overall, NIU shot 12-for-25 (48 percent) in the half, including 4-for-5 on threes, while Ball State only managed to shoot 6-for-25 (24 percent) against a stingy Huskie defense. 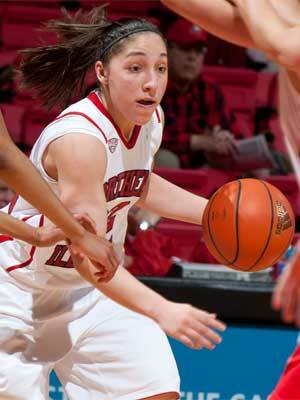 NIU also forced nine turnovers for 12 points. In the second half, NIU pushed its lead to 18 at 8:53 mark and the Cardinals would get no closer than 12 points the rest of the way. Jakubicek led all scorers with 17 points and had a team-high eight rebounds. She also went 3-for-3 at the free throw line to extend her consecutive free throws made streak to 37. NIU wraps up a mini, two-game home stand Saturday, Feb. 18, against Eastern Michigan at 3 p.m. CT. The game will feature $5 pink Huskie T-shirts as NIU will “Pack the House Pink” in conjunction with Colleges Against Cancer for cancer awareness. For more information on NIU women’s basketball and Huskie athletics, visit www.niuhuskies.com.